The Design Homes’ Spring 2018 Promotion has just been announced! Receive up to $7,500 in free upgrades when purchasing a new home with Design Homes. 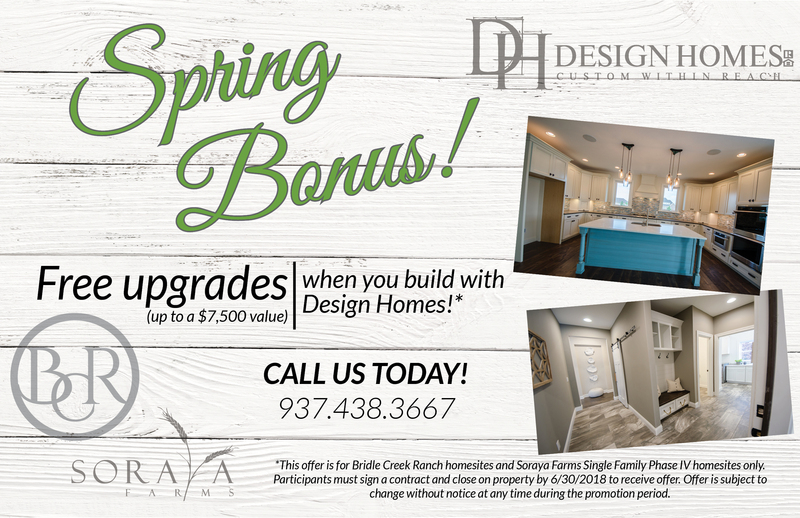 This offer is for Bridle Creek Ranch homesites and Soraya Farms Single Family Phase IV homesites only. Participants must sign a contract and close on property by 6/30/2018 to receive offer. This offer is subject to change without notice, at any time during the promotion period. Features 20+ walk-out homesites ranging between .32 – .55 acres. Features 20+ homesites ranging between .23 – .45 acres.